The North Scottsdale area is a beautiful place to call home. It features beautiful scenery and landscape, an attractive array of recreational activities, golf, great venues to visit and a nice place to work. Sadly, as it is the case almost anywhere in Arizona, North Scottsdale residents may (unknowingly) share their home with a multitude of uninvited visitors-yes I am talking about bugs, pests, critters, or whatever else you may call them. Chances are that you’d rather not be dealing with any of those creatures in or around your home. Varsity Termite and Pest Control has years of experience in assisting North Scottsdale home and business owners in combating those nasty little creatures. And while most bigs have the potential to cause some serious damage, few cause damage as extensive and expensive as termites do. In fact, they are responsible for millions in home damages every year all over the U.S. If you notice any of the above, you probably already have a sizable termite presence in your home. The best course of action is to call your local North Scottsdale termite exterminator as soon as possible. Fighting bugs on your own is not advisable, as they are extremely hard to get rid of. You may have termites even if you haven’t found any of the telltale signs-yet! Because these insects are very common in Arizona, it is a good idea to have your North Scottsdale termite experts conduct a termite inspection of your home. In fact, those inspections are often even required by lenders when you are buying or selling a home, because of the frequency of termite infestations in our region. Varsity has a team of professionally licensed termite exterminators who have years of training and field experience in discovering and dealing with an infestations in North Scottsdale and nearby communities. And best of all- our termite home inspections are absolutely free. Make sure you hire a termite inspector who knows what he or she is doing. An Arizona termite inspection can take from 30 min to several hours depending on the size of your property and the extent (if any) of the damage. You should also get a written report detailing findings, damage and problem areas along with an action plan on how to control the termites in your home. While you may not be able to get rid of those little buggers completely, you can control them exceedingly well-if you work with an experienced pest control professional, such as Varsity Termite and Pest Control. We use various termite removal and elimination methods, including the use of Sentricon, which has shown to be extremely effective. 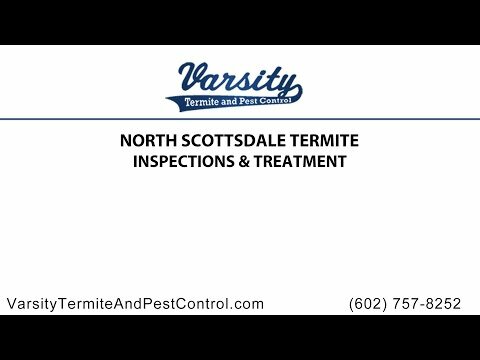 Protect your North Scottsdale home with a free termite home inspection by Varsity. Our experienced and licensed pest control experts can detect termite activity in your walls long before you can. Of course, we offer affordable and effective termite removal and treatments as well. Varsity has assisted many North Scottsdale home and business owners with pest control protection services. While these bugs aren’t likely to hurt you, they can cause excessive and expensive damage to your building. They like it sheltered from heat, a bit moist and with a lot of food, making your home the perfect venue for their party. It can be hard to comprehend the sheer number of termites that may infest your home, as they often can be found in millions. That is a lot of little wood chippers munching away on your (probably) biggest investment. The danger of a termite infestation lies in the possibility of a building collapse and while termites primarily feast on wood, they may very well eat silicone, plastic and other building materials as well. The sooner you deal with the termite infestation in your North Scottsdale property, the better are the odds of getting rid of them, and it will be much cheaper too. Varsity is your experienced and trusted North Scottsdale termite control professional. Contact us today for a free termite home inspection or to discuss a treatment plan. We can assist you with the elimination of other pests such as scorpions, roaches, ants and more, as well.